This is a relatively short climb with only 675 elevation meters but it is highly recommended! The quiet street is narrow and winding, and leads through beautiful villages that have not yet been discovered by tourism, against the background of impressive Dolomite massifs, among which especially the Monte Civetta (3220 m) on the right side of the climbing cyclist should be mentioned. The ride is never boring because the slope is constantly changing. 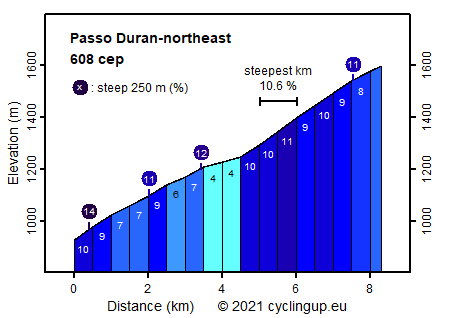 The first kilometer, through and after Dont, is steep (9-10% for the 500 meter intervals). The steepest 250 meters reach even 14%. Then, on the next three and a half kilometers, the road runs through the villages Cordelle, Gavàz and Chiesa. Here the 500 meter intervals have a gradient of 4-9% but there are shorter sections that are steeper (11 and 12%). During the first three kilometers after the last village, Chiesa, the road is consistently steep (9-11%), with short strips (25-50 meters long) that are even steeper. On the final few hundred meters before the pass, the slope decreases.